The Duguid Indigenous endowment was established in honour of Dr Charles Duguid and his wife Phyllis Duguid by Rosemary and Bob Douglas, their daughter and son in law, and their son, Dr Andrew Duguid. Dr Charles Duguid (1884-1986), a Scottish born surgeon, was a tireless advocate on behalf of Aboriginal people. His surname was often mispronounced “Do-good” – a corruption of his name that he lived up to. 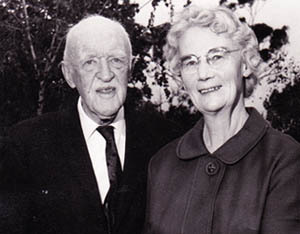 In 1937 Charles, with the Presbyterian Church, founded Ernabella mission, widely regarded as one of the least oppressive and most culturally sensitive missions ever established in Australia. He gained notoriety for the uncompromising stand he took against the Woomera rocket range in 1946–47. During the 1950s and 1960s Charles sought ways to help Aboriginal people achieve assimilation. Rani Kerin, who published a book about the Duguids in 2012, stated that during his lifetime Charles was one of Australia’s most successful, unique and best known campaigners for Aboriginal causes. Charles’ wife Phyllis (1904-1993) epitomized the strength of gentleness and helped to excite and promote his passion for the cause of Aboriginal justice, edited his writings and was a prominent activist for the welfare of Aboriginal women in her own right. Together they were a very powerful force.